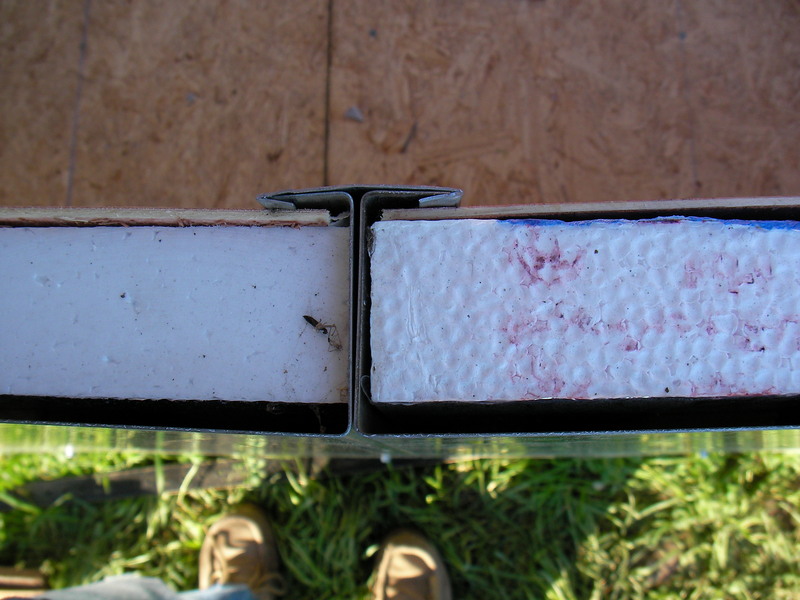 The inside of the wall panel has a 3/8″ air space (thermal break), 1-1/2″ EPS foam insulation, and a pre-finished 1/8″ interior wall panel. There are also half panels (4′ long) and quarter panels (2′ long) that are used to create openings for windows. 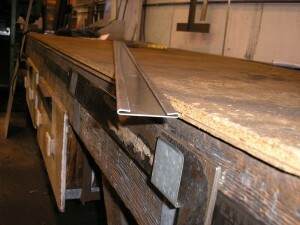 The panels are joined together using ‘c’ clips that slide over the flanges of adjacent panels. One 4′ x 8′ sheet of galvanized steel makes exactly two wall panels and two ‘c’ clips with zero waste. One 4′ x 8′ sheet of EPS foam makes exactly three foam inserts for wall panels, and three interior panels are cut from each 4′ x 8′ panel with zero waste. The second type of panel is the roof panel. It is the same shape as the wall panel, but it is 3-1/4″ thick and 10′ long. There are no variations of the roof panels. 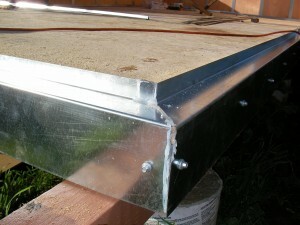 The roof panels have the ‘c’ clip on the outside and the flat galvanized side is the inside. This makes the joint water-tight. A 4′ x 10′ sheet of galvanized steel makes exactly two roof panels with zero waste. 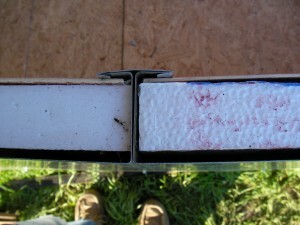 The roof panels are insulated with 2″ thick EPS foam and the foam is covered with a 26 gage galvanized panel. All of the wall panels for a 120 square foot building will fit in a compact truck level with the top of the bed before the foam and interior panel are added. 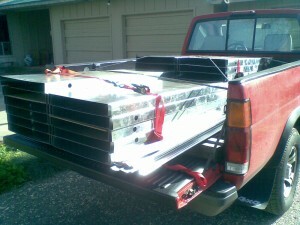 When fully assembled they fill the back of a full-sized pickup to the top of the bed. Everything for 120 square foot building will fit in a full-sized pickup to about the level of the top of the cab. The components for sixteen 120 square foot buildings will fit in a 40′ container. There are a few auxiliary components needed to assemble a building. The bottom sill comes in 10′ lengths and attaches the wall panels to the deck or foundation upon which the building is constructed. It also drains any water that gets between the wall panels to the outside of the building. 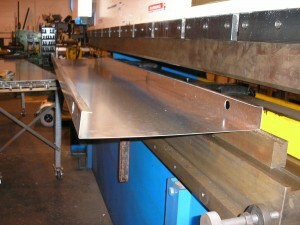 2″ ‘z’ flashing is used under the roof beams and around window openings. A 2″ x 2″ roof beam in 10′ sections is used atop one long wall, and a 2″ x 6″ roof beam in 10′ sections is used on the other long wall. Small ‘L’ brackets along each roof beam hold the roof panels on. Everything was designed to assemble only with clips, but it became too complicated. The floor to wall attachments and roof to wall attachments now use sheet metal screws. This means you really need an electric drill to assemble the building, so I missed on that goal. I was also off on the cost. I estimate my cost in materials and labor to be close to $5,000. However, I bought everything at retail prices and only manufactured components for one building. I think the $2,000 price could be achievable with wholesale materials and a better manufacturing process. It took me about 15 hours to assemble the prototype building, but I believe an 8 hour build time is possible once the kinks are worked out. Overall I’m pretty happy with the way the project turned out. The building was easy to put together and everything fit quite well. The building is very solid. When the panels are clipped together the joint is like an I-beam. The top and bottom sill and roof beam stiffen the walls in the horizontal direction. The resulting structure is rock solid. I can’t tell yet how effective the insulation is. The walls have about an R-9 and the roof R-12. This looks a great start to a wall system, I think with some minor tweaks it could be really effective. I see two issues you may have with the system though. One, you really don’t have a good thermal break – having a continuous piece of metal the goes from outside to inside basically creates a large heatsink. Second, you need something to protect from water infiltration. 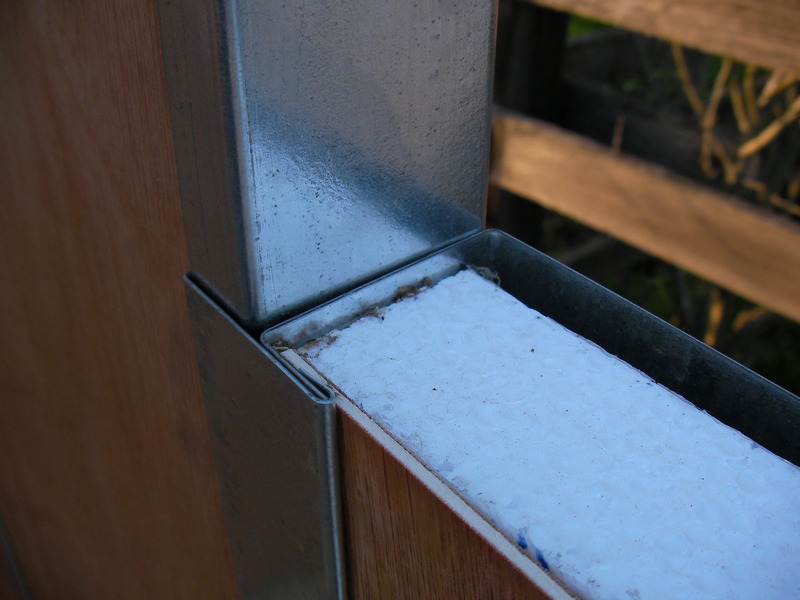 Water will push its way into the gap in your panels, especially if its rainy and windy. Simply caulking it would be a start, although there are other methods as well. Take a look at how modern curtainwall building panels are designed. 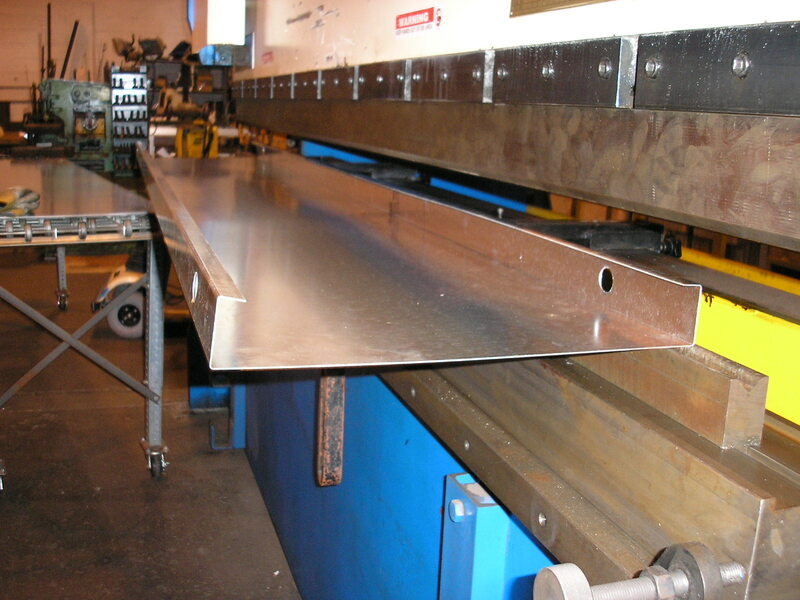 There are a lot of concepts that you could easily incorporate into your system with perhaps just an extra bend or fold in the sheet metal. This looks like a great start though! Heat transfer through the fins has not been a problem. If you do the heat transfer calcs you’ll see why – galvanized metal is very reflective, the fins are very thin, and the surface area inside is small. On a 100 plus day with direct sunlight on a wall the clips inside are warm to the touch, not hot. Water infiltration hasn’t been a problem either. Remember, this is a shelter, not a boat or submarine. It only has to shed water in order to stay dry inside. 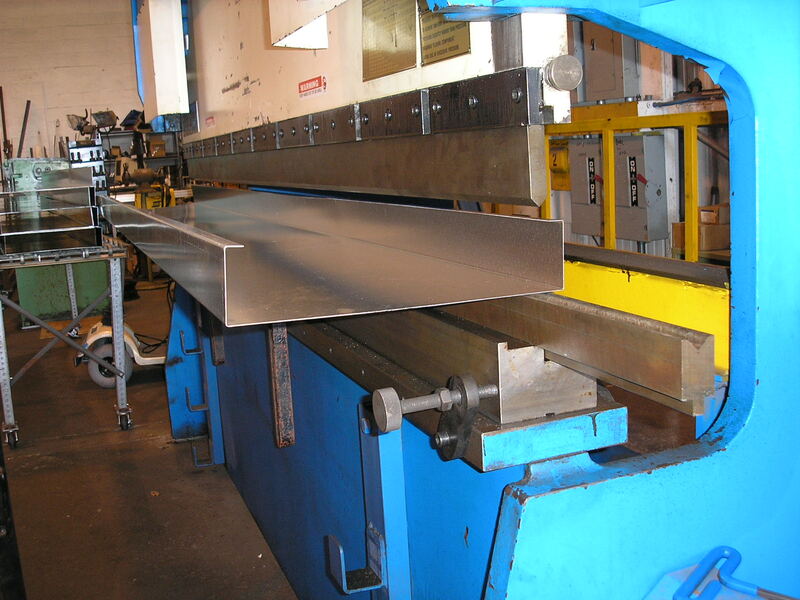 Standing seam construction has a long history and is known for being pretty watertight. I own an old gas station building from the 1950s that was fabricated using similar but less robust seams. It still doesn’t leak after more than 50 years.